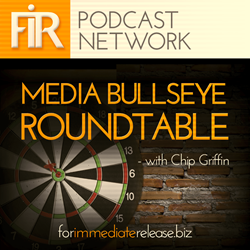 We here at the FIR Podcast Network are excited to announce the latest addition to our lineup of shows: the Media Bullseye Roundtable. Longtime listeners may remember the Roundtable, which we referenced frequently on The Hobson & Holtz Report. Each week, the show’s host joined a guest co-host to discuss three communication-related stories from the previous week. Guest hosts included thought leaders like Doug Haslam and Bryan Person. The Roundtable—produced by longtime FIR sponsor CustomScoop—was suspended a couple years back for various reasons, but CustomScoop CEO Chip Griffin has revived it. The first shows of the reborn podcast have included Sarah Santucci of SMS strategies talking about PR spam, social media advertising, and oversight of marketing activities; and Doug Haslam digging into PR data, metrics, and audiences. The first new episode found Chip reunited with former CustomScoop executive Jen Phillips. Beginning with the episode planned for next Tuesday, July 15, the Roundtable will become part of the FIR Podcast Network. You’ll be able to get it through our “Everything” feed (which delivers every FIR Podcast Network episode to you) or through a dedicated feed just for the Roundtable. It’ll also be available through all the various podcast directories, including iTunes. We hope you’ll join us in welcoming Chip and the Roundtable to the FIR Podcast Network!